Genea-Musings: Amanuensis Monday - 1665 Inventory for Arthur Clarke (1620-1665) of Boston, Mass. Amanuensis Monday - 1665 Inventory for Arthur Clarke (1620-1665) of Boston, Mass. "Massachusetts, Wills and Probate Records, 1635-1991," indexed database with digital images, Ancestry.com (http://www.ancestry.com : accessed 4 July 2016), Suffolk County > Probate Records, Vol. 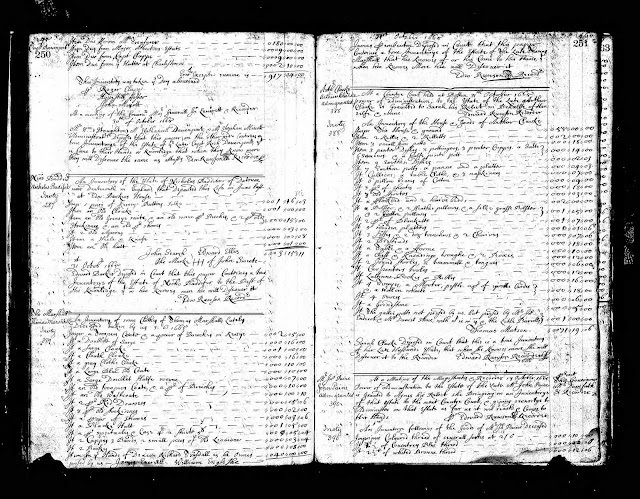 1-4, 1628-1677, Volume 4, page 251 (stamped, image 812 of 832), Arthur Clarke inventory. This record was not found in a search of the Massachusetts Wills and Probate Records, 1635-1991 collection on Ancestry.com. I found the early volumes on Ancestry in the collection, and paged throguh them trying to find probate records for my ancestors. This was actually easier than searching the database! Remember - not every record in any of the state probate record databases is indexed by Ancestry - only a select few. Arthur Clark (1620-1665) married Sarah --?-- before 1644, and they had two children - a daughter Sarah born in 1644, and a son, Samuel Clark, born in 1646. The inventory mentions wife Sarah and a son, but not a daughter. I struggled a bit with some of the words - the spelling was often creative in these records and I am not an expert in 17th century household items. I did the best I could in the limited time available. I am descended from the son Samuel Clark (1646-1730), who married Rachel Nichols (1654-1722) in about 1676. Arthur and Sarah (--?--) Clark are my 9th great-grandparents. Randy, a very valiant effort with difficult handwriting. I do think the "Stock" bed is a flock bed.